- Weight capacity of up to 130 kg. - Weight of equipment: 47 kg. - Can be disassembled for easy transportation. - Battery charger for 115/220 VAC. - Climbing/descending speed: 5 m per minute (loaded or unloaded). - Indicator of slope angle. 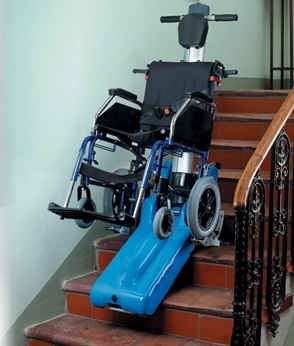 - Works on staircases with angles up to 35o. - Emergency stop button included.